I would like to thank you so much, your Maca has changed my life. I stumbled upon your Maca in my local health food store in Gorey Co Wexford last year. I began taking it after over 17 years of endless doctor’s visits and hospital consultations. I had been diagnosed last year with a 7cm fibroid in my womb and a 5cm cyst on my right ovary, resulting in irregular cycles and crippling periods not to mention the horrendous PMT. I was offered three alternatives at that stage, the first option was contraceptive pills (which cause me anxiety and depression). The second alternative was surgery to cut the blood supply to the fibroid. The third option was a full hysterectomy, which at the age of 37 I was not prepared for. Leaving the hospital that day I was devastated and left dealing with all the on going symptoms which affected my family life and my work life. Luckily not long after I visited my local health food shop and was introduced to your amazing products. From the very first day I began taking Maca it has had a huge positive effect on my health and on my quality of life. At my most recent hospital consultation I was informed that the Fibroid had shrunk and the cyst is gone from my ovary. My cycle has become normal for the first time in my life and the symptoms of my PMT are much improved. Both the quality of the products you are selling and your excellent customer care are a winning combination in every way.. I just wanted to say how great I find your Maca for my PMT. I can’t believe how quick it worked and how well it worked. I suffered with awful symptoms for years and it was getting to the stage where my doctor wanted me to go on anti depressants to combat the pre menstrual downer. This is now gone as is cravings, bloating and tiredness. Every woman should be taking this. Good day to everyone at Sara’s choice. Just a wee message to let you know that I absolutely love your products and really feel the difference when I don’t take them. I’ve been using your Spirulina for a while now and really feel the difference in my wellbeing and overall health. I was late in the day when I last ordered the Spirulina and raw cacao online and it still ARRIVED the next morning! Very impressive….and I was very grateful as I was out of it. I’ll be placing many more orders with you in the future as I can see the integrity and importance you place on the origins of the products you stock. I was using another brand of Spirulina before but never quite felt the benefits I feel with yours. Even the rich colours alone in comparison to the others is indicative of their pureness. I’m wondering if you’ll ever have the opportunity to stock Chlorella? I’ve been looking for a trusted source for this for some time. The type that has the skin cracked for maximum absorption and uptake in the system. I simply love your products, can see and feel the difference in using them and they are cheaper than the well known brands out there. I am telling everyone about them, including Health & Healing and Healthy Habits Stores in Wicklow Town, my friends and family too. Heartfelt gratitude for having the passion and integrity to bring these super health and life promoting foods to Ireland. Please feel free to use some or all of this message as a testimony to these wonder filled superfoods. I have to say that i am so happy to have found your company. I was very particular because i have a toddler and I did a bit of research and discovered that the cleanest spirulina is grown in Taiwan. I searched and searched to try and find some in shops until one day i found your’s totally by accident. We were thrilled because i also feed my toddler with it! You have sourced the most pure spirulina on the planet and the fact that you give the source location transparently on your packaging gave me confidence in your company immediately. Please don’t ever go out of business!!! When i compare your spirulina to other brands they are not even a patch on yours. 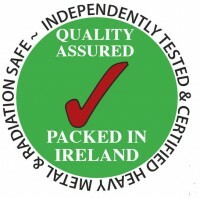 The quality of the product and transparency of information is impossible to find and the wonderful fact that you are an Irish company makes me proud! We would love if you sourced chlorella too if possible at some stage in the future? Thanks Sara we are now addicted to your spirulina! I have been using Maca for the last year or so. I can highly recommend it for a boosting energy levels and hormone balance. It has absolutely no ill side effects and is very easy to take. I am delighted to have found Sara’s Choice, as not only are they Irish but their service is superb and the presentation and delivery of their products is both professional and efficient. Míle Buíochas Sara’s Choice. I wish to take this opportunity to thank you most sincerely for introducing me to Maca and to my wonderful sister in law who introduced me to you. I have had an under active thyroid for the past 8 years. I have been taking Eltroxin and have regular blood checks, however my thyroid function levels have consistently been too high or too low so the dosage of Eltroxin is either being increased or decreased. I have been taking Maca for 1 month prior to my last blood test and for the first time in 8 years my thyroid levels are perfect!! I intend to continue taking Maca and I am due for my next test in 3 months and I have no doubt my Thyroid levels will be perfect again. Moreover, I feel fantastic, my energy levels are at an all time high. I can’t thank you enough. Hi , I’ve recently been introduced to Sara’s Choice Spirulina. Working in a health shop, we like to try out different products in order to give customer feedback. I highly recommend this product, as I’ve noticed my energy levels are much higher, I get things done a lot faster and my hair & skin even looks healthier. It’s a very easy tablet to take, and it’s excellent value. I’ve even recommended it to my friends and family. Got Spirulina package!!! Wow!!!! The frequency of this stuff is AWESOME!!!!!!! I’m excited to start taking! Hi Sara, Happy New Year to you! remarkable improvements in the general health and well-being of my clients mainly female who are now taking your maca and camu camu. I will continue to recommend! Hi there, just to let you know, I have been taking Maca for 10 days and already feel a definate improvement from nasty menopause symptoms. Ive tried alot of alternative treatments so I really wasnt expecting too much but was open minded and willing to give Maca a go and needless to say Im pleasantly surprised. Im taking 4 caps per day, do I maintain this amount or reduce after a period of time? The hot flushes are reducing in number and intensity, Ive lost some stomach fat and generally feel more energised. Thanking you, C.D. I’ve been taking Maca for about a year, and “wouldn’t” be without it – Why? Just 3 weeks after starting, I noticed a remarkable change in my physical stamina. The proof of which was, that on returning home after a full day at the office, I was hardly able to bring the dog for a stroll. Now I bring him for a power walk of 5km daily. My energy at all levels is amazing. Sara’s Choice will “always” be my choice! Noreen P.
I was on HRT for 14 years. My doctor refused to write another prescription for me. Within a short time I was suffering with almost constant hot flushes, sleepless nights and terrible moodiness. I didn’t know what I was going to do. A friend of a friend told me about your maca. I started taking 4 capsules every day, there was a reduction in flushes from the second day and after 2 weeks I was only having 2 flushes a day! I eventually increased to a total of 8 capsules and I’ve been on it now about a year and have just gotten better and better. I have more energy, sleeping like a baby and people have even commented on how youthful my skin looks. Can’t thank you enough Bernie M.
I use Sara’s Choice Maca capsules. I am grateful to have discovered them as I now have my life pretty much back on track after being unwell for almost two years. Within three weeks of starting Maca at six per day, I noticed that my energy was much improved and I was not half as tired as previously which is great as my job is quite stressful and busy. I was working away from home and ran out of Sara’s Choice and got a different brand in the local health shop. Noticed within a week that the energy levels were not at all as good even though the jar stated 500mg. I have M.E. and your Maca has given me excellent results, delighted to be able to recommend your product to fellow sufferers Deirdre M.
Hi Sara, I met you in the health store in Galway a few weeks ago. I’ve been taking the maca supplements since and can’t believe how different I feel. For the first time since having my son 11 months ago I feel energetic and in control again. I’m sleeping better, feel much happier I just can’t believe it so thank you! Fiona N.
Maca has made such a difference to the overall quality of my life, in terms of both physical and mental well-being and stamina. Where standard conventional medical approaches had failed me dismally over a number of years, involving costly and almost endless consultations with a variety of specialists, Maca has succeeded beyond my wildest dreams and in such a short period of a few months in terms of stress relief from chest and abdominal pains, improved appetite, greatly more relaxed and much better sleep patterns at night, and much-restored energy levels. In short a return to the original self with greatly-boosted zest for life and work which I had feared were for long things of the past’ never again to return Sean O’H. Hi Sara, been taking the Camu for 10 months now, it’s fantastic! As you know I was on Prozac for 9 years and every time I tried coming off it, I’d be fine for maybe 2 or 3 months and then I’d start going down hill into depression again. I couldn’t afford to be depressed in my job so I’d have to go back on it. Well it hasn’t happened this time and I’m just so grateful. Not just that but I used to get a lot of headaches and sinus pain but that has all stopped since taking your Camu Camu.. Went to see my doctor last month and he just couldn’t get over how well I’m doing and looking-I’ve lost a stone in weight too! Many many thanks Sharon M.
I started using Maca in March this year, after doing some research on the internet. I had collapsed and spent some time in hospital with continual flooding!! I was being sent for a hysterectomy in May, which I cancelled!! The maca has been amazing. I’ve told everyone about it. I’m involved in sport in a big way and it has saved me. Trying to get the other half on it but at the moment he’s managing the Omegas! Well that’s a start. Oh yes I have also been taking your Camu Camu but didn’t realise it was good for my skin, I’ll be taking it in earnest now!! A million thanks Roz M.
Had to email you-came down with tonsillitis & flu last week, heard about your Camu and decided to give it a try-I took 4 each day and on the third day it was gone-you’re not joking this stuff works! Should be in every chemist in Ireland! Bridget K.
Met you at Wicklow health store 3 weeks ago. I was telling you I hadn’t slept for more than 3-4 hours since my husband died 5 years ago. Well after being on your Maca about 10 days I slept for 7 hours!! And the hot flushes are gone completely-wonderful product-thank you so much! Mary K.
Hi Sara, I read an article about you in the Galway Advertiser and your use of Maca. It greatly interested me as I am a pituitary patient whose adrenal gland does not function. As a result of this I am on a replacement steroid and have gained immense weight – no matter how much exercise/change of diet would not shift. After much deliberation, I decided to try Maca and how delighted I am that I took that step! I have been able to reduce my steroids. I feel more “alive” and my weight has started going in the right direction – first time in 10 years! People have said how much better I look and my hairdresser commented on the improvement in my hair – all of this when I was on Maca for a month! I am only sorry that Maca was not available to me sooner! Regards,T.